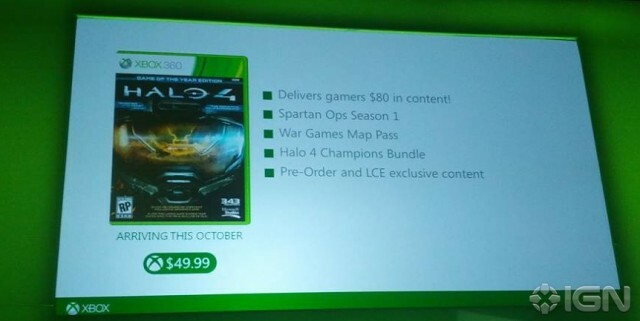 Along with Dishonored, Borderlands 2 and Injustice, Halo 4 will be releasing a game of the year edition, complete with all DLC, Spartan Ops Season 1 and all Pre-Order Bonuses, The GOTY Edition will be available in October for $49.99 USD. A Game of the Year Edition of Halo 4 will be offered this October, offering tremendous value for fans who want to enjoy one of the most critically acclaimed games of 2012, and additional DLC all in one place. We will have more details to share during the live stream of the Halo Global Championship Finals this Sunday. Spartan Ops Season 1: Bringing you hours of content from the 10 CGI Episodes and 50 missions. Pre-Order and Limited Edition exclusives: This includes ALL pre-order incentives from stores like Gamestop, EB Games, MightyApe, Amazon, plus the bonus content from the Limited Collectors Edition. Its unknown whether the Fotus ‘Unicorn’ Armor will be included as well. This announcement was unexpected, hopefully those new to the franchise will see the amazing works of 343, or if you REALLY want those armor skins, you can get the game. I hope this also means more people on Multiplayer.